Earl of Wilton, of Wilton House in the County of Wiltshire, is a title in the Peerage of the United Kingdom. It was created in 1801 for Thomas Egerton, 1st Baron Grey de Wilton (1749 – 1814) along with the subsidiary title of Viscount Grey de Wilton, also in the Peerage of the United Kingdom. Both titles were created with remainder to the second and all younger sons successively of his daughter Lady Eleanor, wife of Robert Grosvenor, 1st Marquess of Westminster. 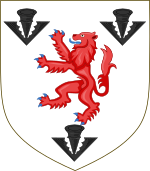 Arms: Quarterly: 1st, Azure, a Garb Or (Grosvenor); 2nd, Argent, a Lion rampant Gules, between three Pheons ponts downwards Sable (Egerton); 3rd, Barry of six Argent and Azure, a Label of five-points Gules (Grey de Wilton); 4th, Argent, a Mullet Sable, pierced Argent (Assheton). Crest: A Talbot statant Or. Supporters: On either side a Talbot reguardant Or, collared and charged on the shoulder with a Mullet Azure. Thomas Egerton (1749 – 1814), who became 7th Baronet in 1756, Baron Grey de Wilton in 1784, as well as Viscount Grey de Wilton and Earl of Wilton in 1801. Arms of the Earls of Wilton from the Egerton family. Arms of the Egerton Earls of Wilton (1801-1999). The 1st Earl of Wilton was a member of the Egerton family and the eldest son of Sir Thomas Grey Egerton, 6th Baronet of Egerton and Oulton. He had earlier resided at Heaton Hall near Manchester and represented Lancashire in Parliament, was a descendant of Sir Roland Egerton, 1st Baronet, who married Bridget, sister and co-heir of Thomas Grey, 15th Baron Grey de Wilton, who was attainted in 1603 and forfeited his title. Thomas Egerton succeeded his father as 7th Baronet in 1756 and in 1784 was created Baron Grey de Wilton, of Wilton Castle in the County Hereford, in the Peerage of Great Britain, with remainder to the heirs male of his body. When Thomas Egerton, 1st Earl of Wilton died in 1814, the Grey de Wilton barony became extinct as he had no male heirs, while the Grey Egerton baronetcy passed to his kinsman John Grey Egerton (1766–1825), who became the 8th Baronet. The titles of Earl of Wilton and Viscount Grey de Wilton passed, according to the special remainder, to the 1st Earl's grandson Thomas Grosvenor (1799–1882), who adopted the surname of Egerton and became the 2nd Earl. He was the second son of Lady Eleanor and the first Marquess of Westminster, the younger brother of Richard Grosvenor, 2nd Marquess of Westminster and the elder brother of Lord Robert Grosvenor, who was created Baron Ebury in 1857. The second Earl notably served as Lord Steward of the Household in 1835 in the Tory administration of Sir Robert Peel. His eldest son, the 3rd Earl of Wilton, represented Weymouth and Bath in Parliament as a Conservative. In 1875, seven years before he succeeded his father, he was himself raised to the peerage as Baron Grey de Radcliffe, in the County Palatine of Lancaster. However, the 3rd Earl was childless and on his death in 1885 the barony became extinct. He was succeeded in the other titles by his younger brother, the 4th Earl of Wilton. On the death in 1999 of his great-grandson, the 7th Earl of Wilton, the line of the second Earl failed. He was succeeded according to the special remainder by his kinsman Francis Egerton Grosvenor, 6th Baron Ebury (b. 1934), a great-great-grandson of the aforementioned Robert Grosvenor, 1st Baron Ebury, who became the eighth Earl of Wilton. Seymour William Arthur John Egerton, 7th Earl of Wilton (1921–1999), succeeded to the earldom at the age of 6. Having no children, he was succeeded by his kinsman, Francis Egerton Grosvenor. Francis Egerton Grosvenor, 8th Earl of Wilton (b. 1934), son of Robert Egerton Grosvenor, 5th Baron Ebury. The heir apparent is the present holder's only son, Julian Francis Martin Grosvenor, Viscount Grey de Wilton (b. 1959). ^ "No. 15375". The London Gazette. 13 June 1801. p. 657. ^ "No. 12541". The London Gazette. 11 May 1784. p. 1.